The plot of Gears of War 4 is the most low stakes the franchise has ever been. Ironic, kind of, because it's probably the highest stakes ever for Xbox. With Epic Games no longer serving as its guiding hand, Xbox is left to see if the series can thrive under new leadership with new characters and a new story arc. The short of it is that the series can and will continue to thrive and that's because Gears of War still makes for one hell of an action game. But, developer The Coalition doesn't always handle the transition fluidly, often struggling to strike a balance between new Gears and the ghosts of its past. 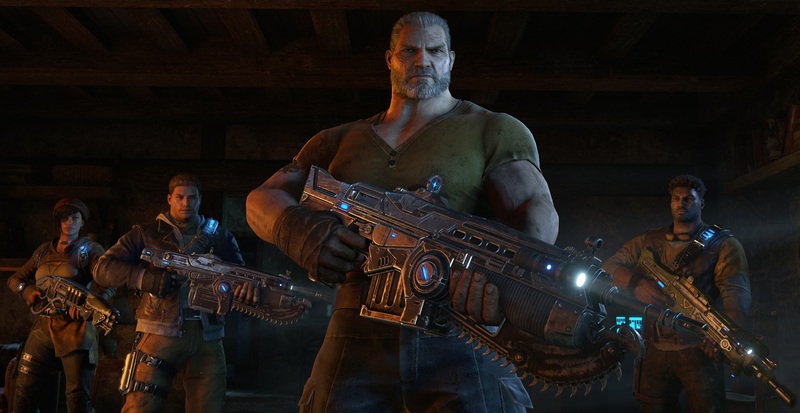 At the beginning of the original Gears of War, the COGs are already engaged in full-scale conflict. That ongoing battle with the Locusts (and later the Lambent) drives the entirety of the trilogy. The first game is self-contained, and things balloon from there. 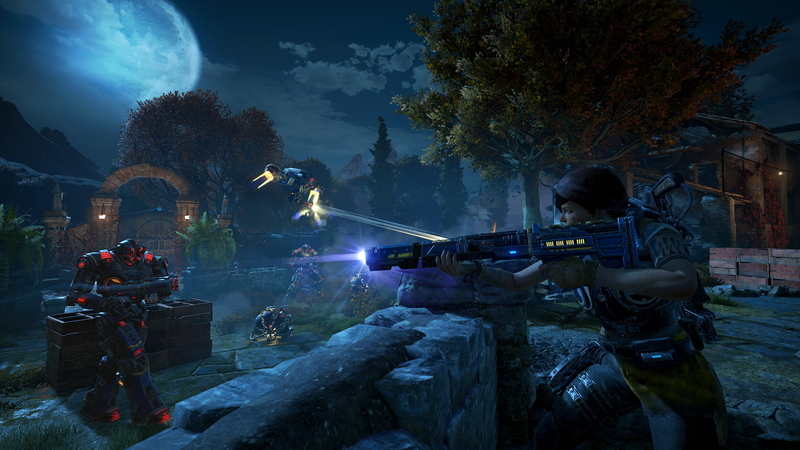 By the end of Gears of War 3, the scope of matters has grown immeasurably. 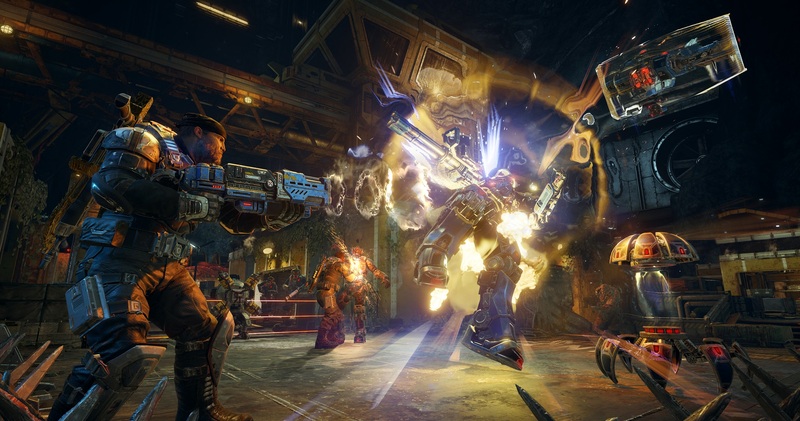 Gears of War 4 takes a decidedly different approach. It begins (after the prologue that serves as a tutorial, that is) with new protagonists JD, Del, and Kait trekking through the Sera wilderness. They're looking to break into a COG compound to steal a fabricator -- a source of energy to power Kait's village. Comparatively, this is about as quiet as Gears of War can possibly be. There are some firefights against a new aggressive robot enemy, but there's also time to ask questions. Why are the COGs trying to kill JD and Del? What did those two do to become disavowed soldiers? How much more is there to learn about their pasts? It isn't long before that's largely washed away. Soon after, we encounter old friend Marcus Fenix and the plot follows a more Gears-like direction. There's never anything as grand as the fate of humanity at stake, though -- or at least not that we're told. Maybe we'll get there in a few games' time. Gears of War 4 is a more personal story. Family relationships are front and center in Gears of War 4. Recovering Kait's mom after she's captured by the Locust-like Swarm is the main reason for this journey. Tangential, but probably more important to the player, is the strained father-and-son relationship between Marcus and JD. Marcus is none too happy that JD dragged him into this mess while he was enjoying his life of relative retirement. There's something more to it, though. With Gears of War 4, The Coalition is content to ask many questions but sufficiently answer few of them. That's its most striking shortcoming. This is a game that's very obviously in service of a trilogy. A lot of plot threads are left hanging, even ones that are teased so often it seems impossible that they wouldn't be addressed. That will presumably come in a future game. But the best trilogies are the ones where each title stands on its own merits and Gears of War 4 doesn't really do that; instead, it aims to be one-third of a story that might eventually be good. It doesn't help matters that this game does very little to make JD a reasonably interesting character. Del is surprisingly funny, and Kait has a charm about her that's endearing. JD, from beginning to end, does almost nothing that makes him feel like a protagonist worthy of carrying this franchise. He doesn't even have the gruff mannerisms of his father. He just exists as a vessel through which Gears of War happens, and that's the most unfortunate possible outcome. There are also moments throughout the campaign when it's tough to tell if The Coalition is paying homage to the series' roots or if it's retreading territory for lack of ideas. Act one ends with a terrifying scene that's reminiscent of General RAAM executing Lieutenant Kim. Act two closes with a vehicle section that might end up as divisive as the infamous "Burnt Rubber" chapter (although surely not as difficult). 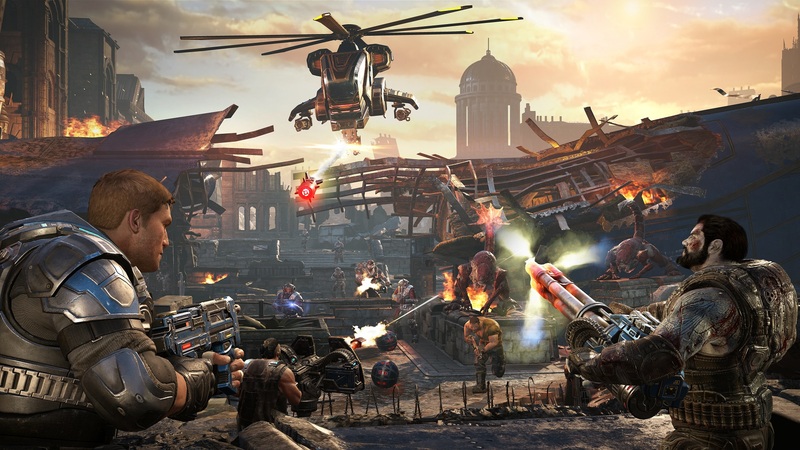 Gears of War 4 has no qualms in drawing inspiration from its past works and that's sometimes disappointing, sometimes comforting, and sometimes both at the same time. However, when classic Gears of War stuff happens -- which is most of the time -- it's generally excellent. It's important to remember that this is a series that not only popularized a lot of third-person shooter mechanics in the last decade of video games, but that it also executed them in an exhilarating way. The feedback loop of shooting, killing, ducking into cover, nailing an active reload, and shooting again is a process that continues to be tremendously satisfying. Even if the story leaves something to be desired, The Coalition proves that it knows how to craft an enjoyable game. 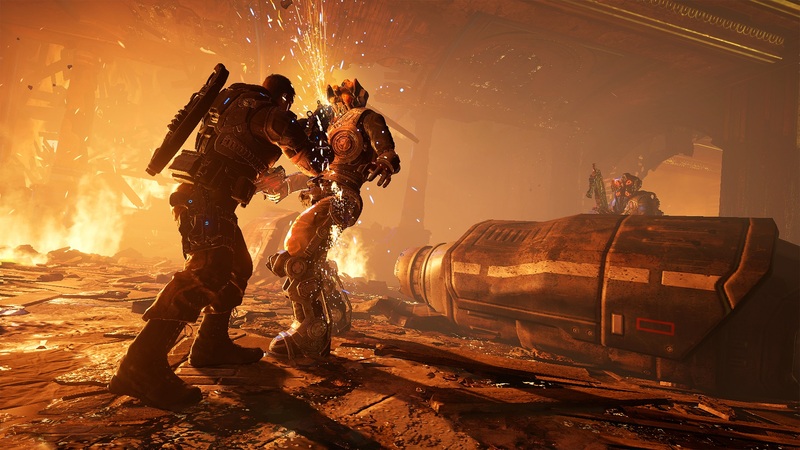 The tone and setting is more consistent with the original Gears of War than any follow-up. Many of the chapters are set in dark, haunting environments that seem as if they'd lend themselves better to a horror piece rather than an action romp. 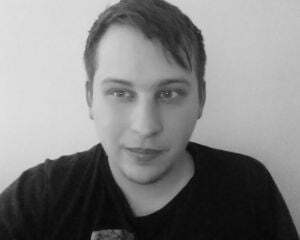 At times, Gears of War 4 is a blend of both genres when it mixes distress, uncertainty, and danger. Other times, it leans on over-the-top set pieces, like a trebuchet that rains fire, to get its point across. While these weapons competently get the player through the minute to minute of Gears of War 4, it's the power weapons that are the most impactful. The Buzzkill shoots saw blades across the battlefield, ricocheting off any surface they touch. The Dropshot launches aerial bombs that dive straight down onto an enemy's head. They're not exactly common to find, but they're a blast anytime they're used skillfully. All of this together -- the weaponry, the level design, the set pieces, the squishy enemies -- is what makes Gears of War a pleasure to play. This installment carries that tradition on beautifully. If the story isn't always incentive enough to continue forward, the exemplary gameplay will be. It's easier to shoulder the burden of a lacking narrative when playing is far from a chore. Gears of War distilled to its purest form (and without obligation to provide a plot) is the competitive multiplayer. The standard Gears offerings like Execution, King of the Hill, and Warzone are all here and at 60 frames per second. Social and competitive matches take place across 10 maps. It's mostly standard fare, but, like with the other games, it again works brilliantly. The places where The Coalition sought to leave its mark on competitive multiplayer seem to have turned out fantastically. New modes are the main innovations, specifically Dodgeball, Arms Race, and Escalation. Dodgeball is a tense back-and-forth as each death revives a player on the other team. This is the mode where heroics are most likely, as a five-on-one can turn into a four-on-two which can lead to an even three-on-three. Arms Race starts both teams out with the Boomshot, the game's most powerful weapon, and eventually works them down to the least useful weapons. It takes three team kills with each weapon to move onto the next one. Besides being a clever idea, Arms Race creates some interesting dynamics when, say, one team has Longshots and the other has Gnashers. Lastly, Escalation is a best of 13 rounds (!) game where teams vie for control of three different zones. Capturing all three at once immediately ends the round, but sometimes it's wiser to hold down two and run the clock out. This is the mode that The Coalition pegs as having "eSports potential." Competitive multiplayer is proficiently handled, but it's not all that varied from what Gears of War has seen in the past (and that's perfectly fine). The same can't be said for this iteration of Horde. This is Gears of War 4's biggest overhaul, as it breathes new life into the cooperative mode. This version of Horde is a class-based affair where everyone has a job to do. The centerpiece is the fabricator, a chest where energy is deposited and reinforcements are pumped out. Engineers are in charge of overseeing and managing the fabricator. Scouts are little fast guys who scurry about the battlefield to collect dropped energy and return it to the engineer. Soldiers act like normal Gears characters. Heavies spawn with power weapons. Snipers shoot things from a distance. Classes add a neat touch of variety to the mode, but it's really the fabricator that changes its function. Instead of rewarding those who hunker down and survive, Horde 3.0 incentivizes movement. Without doing that, the fabricator will run dry, new protection can't be forged, and dead soldiers can't be revived. It's imperative that everyone play to their roles for the good of the team. Those without a crew will have the opportunity to sample Horde in the main story. There are a handful of defense sections that feel as if they were ripped straight out of multiplayer and stitched into the campaign. It's not really representative of what Horde 3.0 is and it feels like an awkward attempt to sell the player on the game's other features. 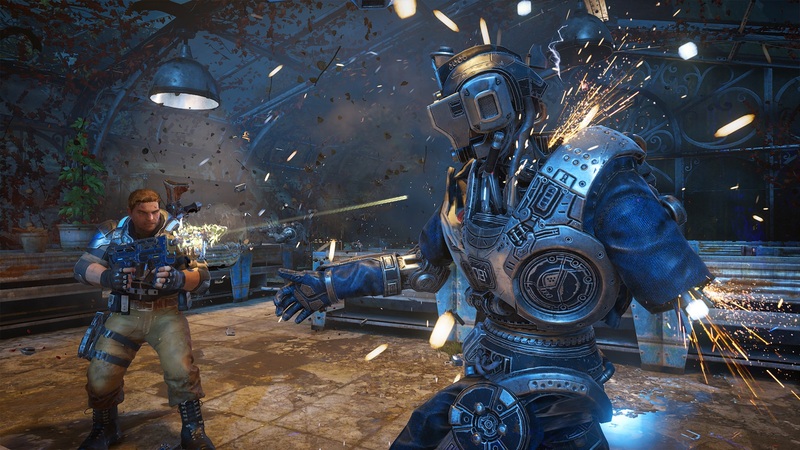 Core Gears gameplay is always best when you're the aggressor. These moments stand out as some of the worst in the campaign despite featuring a mode that's excellent on its own. The Coalition is still in its relative infancy as a developer. 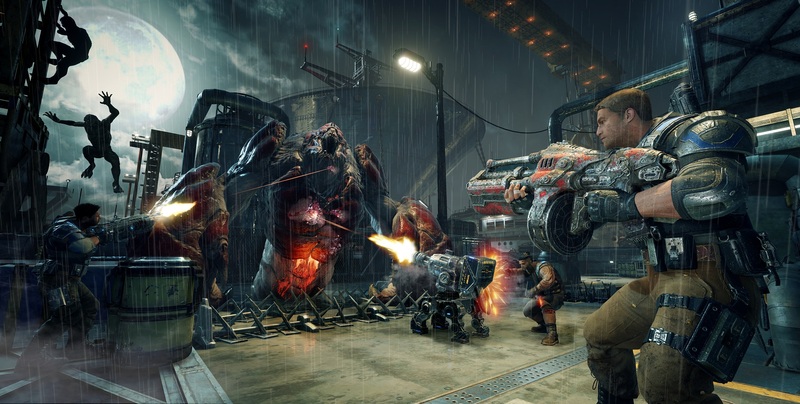 Gears of War 4 is the first game that it can call its own. No doubt that there are missteps, mostly with regard to the narrative and the pacing, but there are a lot of bright spots too. Even if this is only an okay Gears of War game, it's still a fantastic video game. That says a lot about the pedigree of this franchise. The nature of Gears of War 4 is that we won't know its legacy until there are more games in the canon. That's frustrating now but it'll hopefully be exciting later. This was a fine first showing but it'd be nice to see The Coalition carve its own identity for Gears of War. Using Epic's foundation is understandable and expected, but it often feels like a crutch. Marcus' boy had grown up just like him.